An important panel at the United Nations Educational, Cultural and Scientific Organization (UNESCO) on Wednesday morning approved a controversial resolution that ignores Jewish and Christian ties to the Temple Mount. The decision came a week after a similar resolution was approved by the body and elicited angry responses from Israel, several world leaders, and even the body’s own director-general. 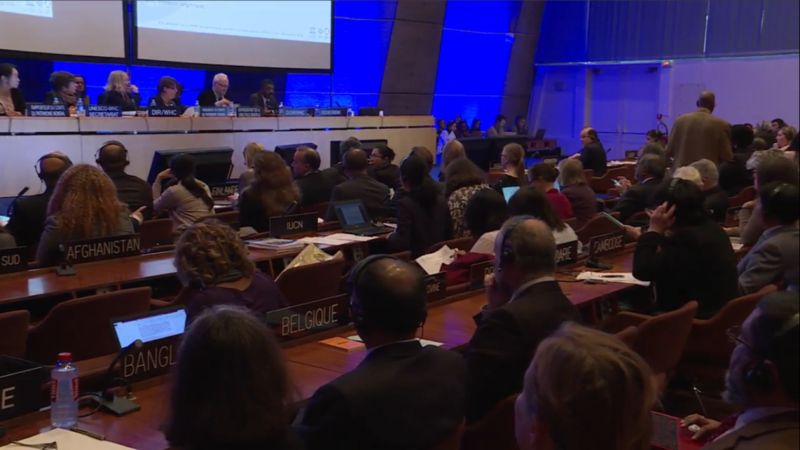 Convening at its annual meeting in Paris, UNESCO’s World Heritage Committee adopted Draft Resolution 40COM 7A.13, entitled “Old City of Jerusalem and its Walls,” by a large majority, with 10 countries voting in favor, eight abstaining and two opposing the text. Eight “yes” votes were needed for the resolution to pass. This year’s member countries of the committee made things particularly difficult for Israeli diplomats battling the resolution. Germany, Colombia, and Japan, all sympathetic nations to Israel, are no longer involved, and in their place are Tunisia, Kuwait, Lebanon and Indonesia, bringing to nine the total number of Muslim countries. Those nine and Vietnam were all assumed to have voted for the resolution. Poland, Finland, Croatia, Portugal, the four European countries, had indicated they would abstain. The 21 nations with voting rights on the World Heritage Committee were: Finland, Poland, Portugal, Croatia, Turkey, Azerbaijan, South Korea, Indonesia, the Philippines, Vietnam, Kazakhstan, Tunisia, Kuwait, Lebanon, Peru, Cuba, Jamaica, Burkina Faso, Zimbabwe, Angola and Tanzania. “This is yet another absurd resolution against the State of Israel, the Jewish people and historical truth,” Israel’s ambassador to UNESCO, Carmel Shama-Hacohen, said after the vote. The fate of the resolution would be no different from United Nations General Assembly Resolution 3379, which equated Zionism with racism, he predicted, noting that that resolution was overturned 16 years after its adoption in 1975. Recalling that Israel’s ambassador to the UN at the time, Chaim Herzog, tore apart a copy of that resolution, he said that UNESCO’s resolution on Jerusalem belonged in the garbage bin of history. “I have no intention of doing this today — not because of your dignity, or the dignity of this organization, but because it is not even worthy of the energy needed for tearing it apart,” the Israeli envoy said, before proceeding to lift up a black dustbin with the word “History” on it and place a copy of the text inside. Israel’s ambassador to the United Nations, Danny Danon, also condemned the decision. At the opening of Wednesday’s session, the chairperson of the World Heritage Committee, Turkish diplomat Lale Ülker, proposed that the resolution be adopted “by consensus,” which would have given the appearance of a unanimous decision. 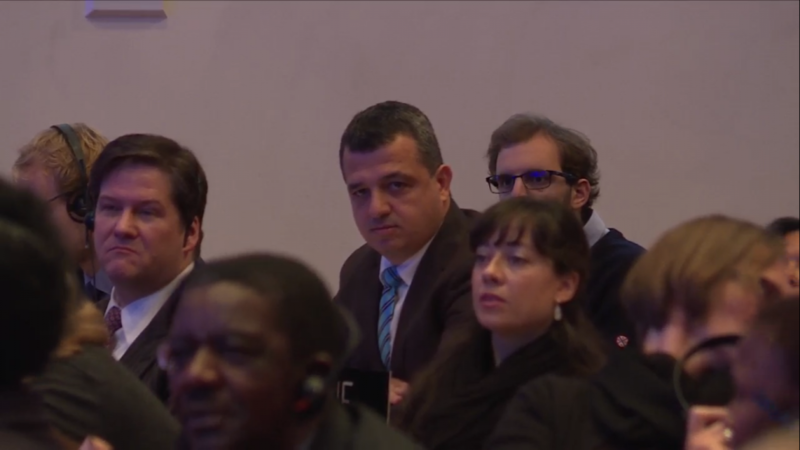 A majority of member states supported her proposal, but Tanzania and Croatia asked for a secret ballot. Despite vociferous opposition by Lebanon, Tunisia, Cuba and other states that pushed for “consensus,” the committee’s legal adviser eventually ruled that a secret ballot would be held on the resolution, paving the way for the two “no” votes and the eight abstentions. According to Shama-Hacohen, Netanyahu instructed him to work to convince countries likely to abstain, to go further and cast a vote against the resolution, arguing that an abstention would be akin to support. He described the resolution as “diplomatic jihad” against the Jewish people, Judaism and Christianity. The earlier resolution, which was approved October 13 at the UNESCO committee stage with 24 “yes” votes, six “no” votes and 26 abstentions, and then formally confirmed by UNESCO’s executive on October 18, sparked vociferous condemnation in Israel, as well as from UNESCO’s own director, Irina Bokova, and several foreign leaders. Last week’s text referred to Israel as “the occupying power” at the holy sites. The resolution adopted Wednesday — sponsored by Kuwait, Lebanon, and Tunisia — did not, which Israel considers a minor victory. In another significant divergence from the October 13 text, the new version did not put quotation marks around the designation “Western Wall,” a punctuation seen in Israel as bolstering the original resolution’s disdain for Judaism’s connection to its holiest site. The adoption of the resolution creates an absurd situation whereby the archaeological digs on and around the site of the Temple Mount, which have unearthed copious evidence of a Jewish connection to the site, may now be designated as destruction of the Muslim site.